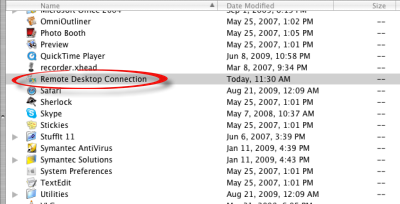 How to use Kurzweil from a Mac through Remote Desktop Connection. Step 1:Download and install (free) Remote Desktop Connection Client for Mac 2 from the web at http://www.microsoft.com/mac/products/remote-desktop/default.mspx.Step 2:Open your Applications folder and select Remote Desktop Connection. 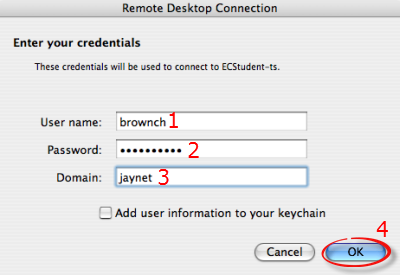 Step 3:In the Computer text box, type "ECStudent-ts" and click Connect. Step 4:Enter your Etown network username and password. Name the domain as "jaynet". Click OK, then Connect. Step 5:When the remote desktop appears, maximize the window. Step 6:Click the Start menu button, then choose All Programs and Kurzweil. Step 7:The first time you use Kurzweil, enter your username. All subsequent times, select your name from the list. Step 8:To close remote desktop connection, close any running programs. 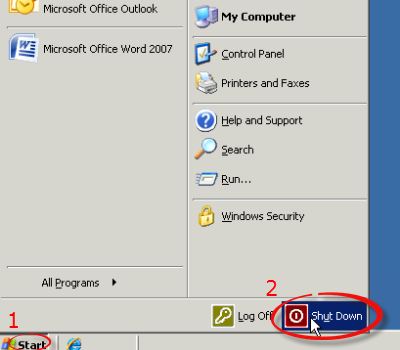 Click the Start menu button, then select Shut Down.